In honor of David Bowie and Iman's 20th wedding anniversary, here is a cento poem made from a selection of David Bowie songs. The title and all lines are from David Bowie songs (citations and links to videos below). I pieced it together myself. I'm not sure if it's good, actually; I am too familiar with the songs to not hear the tune as I read the lines, making the whole sound kind of funny. It's just silliness anyway. 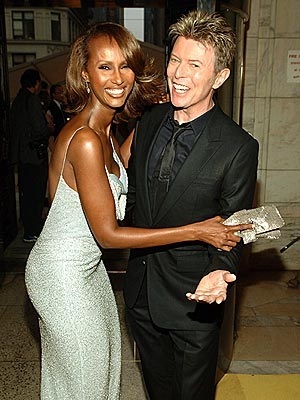 This is written from the perspective of Mr. Bowie (or how I imagine his perspective to be) to his beautiful wife, Iman. Enjoy! The happy couple! :) I think they always look so happy together. This time tomorrow I'll know what to do. A love so real swept over me. I moved up to take a place near you. Stay with me, be my wife. I could make you happy every day of your life. It's love back to front and no sides. If you stay you won't be sorry. "Soul Love." The Rise and Fall of Ziggy Stardust and the Spiders from Mars. 1972. "Stay." Station to Station. 1976. "Never Let Me Down." Never Let Me Down. 1987. "The Prettiest Star." Aladdin Sane. 1973. "A Better Future." Heathen. 2002. "Be My Wife." Low. 1977. "Shining Star (Makin' My Love)." Never Let Me Down. 1987. "Because You're Young." Scary Monsters and Super Creeps. 1980. "As the World Falls Down." Labyrinth. 1986.